Totten Glacier. A mountainous expanse of ice in the very heart of the greatest accumulation of frozen water on Earth. A bastion of cold containing 11.5 feet worth of sea level rise if it were to melt in total. An accumulation roughly equal to half of all the frozen water in the whole of the Greenland Ice Sheet. According to a new scientific report out this week, Totten Glacier is under threat of melt. Warm water is swelling up through troughs in the Continental Shelf zone, approaching the ice shelf locking Totten and a vast swath of interior East Antarctic glaciers. As with West Antarctica, this warm water upwelling has the potential to rapidly destabilize an already fast-moving glacier. Totten already hosts one of the most rapid thinning rates in East Antarctica. And, in fact, it was a satellite detection of this very thinning that set off a recent scientific investigation of the glacier’s stability. What the new scientific report identified was a threat that enhanced warm water upwelling from a human-heated circumpolar current would collide with an ice structure that is already vulnerable to melt. The net result would mean a destabilization and acceleration of one of the greatest ice masses on the planet. Such an event would have far-reaching implications, especially relating to the pace and end state of warming-related global sea level rise. The pathways are identified by the orange lines in the topographic image above. The lines identify underwater valleys that run out to the deeper, warmer waters accumulating on the edge of the Antarctic Continental Shelf region. 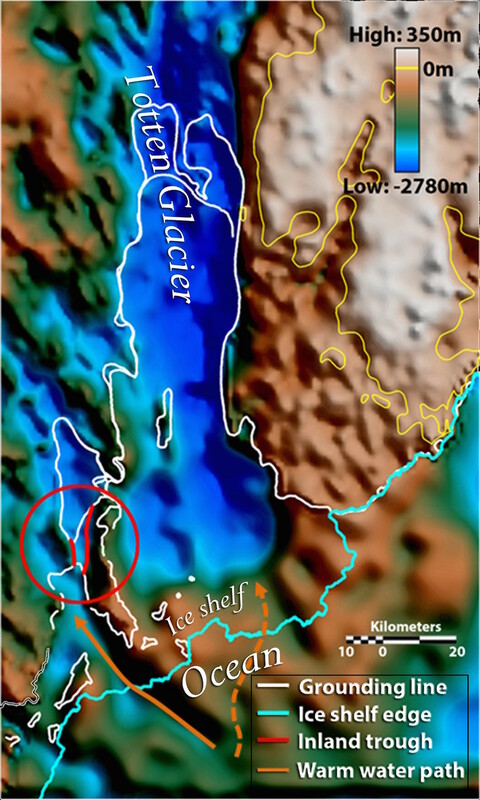 As the waters rise, scientists are concerned that these troughs will act like channels, funneling a flood of much warmer than normal water beneath the belly of the great glacier. 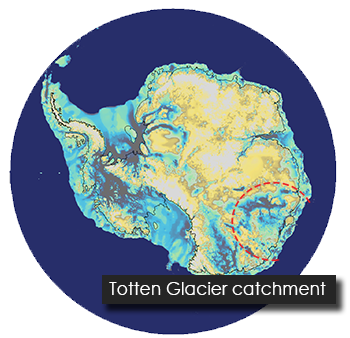 We estimate that at least 3.5 m of eustatic sea level potential drains through Totten Glacier, so coastal processes in this area could have global consequences. Indeed. If we add in all the other destabilized glaciers around the world to Totten, should it destabilize, you end up with about 26 feet of sea level rise locked in. 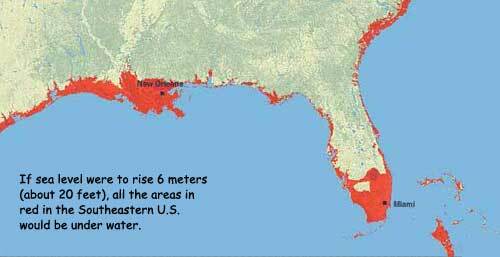 And that has some pretty staggering consequences when you look at impacts to the world’s coastlines. But, perhaps worst of all, is the fact that some of the world’s longest lasting and most stable accumulations of frozen water are now under threat of melt. In essence, what we are witnessing is possible initiation of the end of the greatest and oldest ice province on Earth. East Antarctica glaciated 35 million years ago, when atmospheric CO2 levels fell below a range of 500-600 parts per million, and has been mostly stable or growing ever since. Now that region of ice, the most ancient remaining in the memory of Earth, is under threat. With human greenhouse gasses in the range of 484 ppm CO2e (CO2 equivalent) and 400 ppm CO2 and rising, it appears that even the oldest glaciers are under existential threat.